Mr E from Welling contacted Wessex Sectional Garages as he was looking for a Company to supply him with a new concrete sectional garage. He was going to remove his old garage and shed and felt that to replace these with one building would be much neater. The new Apex Garage was built with the up and over door to the left-hand side of the garage to line up with the drive access. Our customer in Hindhead, Surrey had an old carport that was falling down. He wanted to replace this with a new Concrete Garage with an all round Brick finish to all panels giving him a new secure building. As we specialise in the Concrete Sectional Garage market we were able to supply our customer with the exact design of building he required. Our Client in Stonehaven required two buildings to be built along side each other. We discussed the specification he was looking for and were able to offer him two identical Garages at a very competitive price. Each Garage was designed to his requirements including two electrically operated up and over doors to the front of each building. Our client in Haslemere, Surrey was looking to replace an old Garage. Being in an Area of Outstanding Natural Beauty they needed to get planning permission. As soon as the size and design was agreed we were able to provide our client with the necessary drawings for the planners. The new Apex Garage in a Brick finish with Grey Metrotile roof was delivered and erected as soon as planning was passed. Recent installations to replace old Garages. The new Concrete Sectional Garages being built on to the Client’s existing bases. The new Concrete Garages were required to provide secure storage solutions including one to store their gym equipment in. The Mansard roof design is becoming very popular offering an attractive alternative to the traditional Pitched and Pent roof style. Available with either a Granular Metrotile or authentic looking slate roof to the front elevation. Out client in Coventry chose a Charcoal Metrotile tile effect roof with brick front posts and a Georgian style up and over door. Competitively priced single Concrete Garages with Apex style roofs were delivered and erected for our clients in Camberley, Surrey and Woking in Surrey. A Double Prefab Concrete Garage with 14′ wide up and over door was delivered and erected for our Client in Harrow, Middlesex. A Large Single Concrete Sectional Garage with Rosewood decograin up and over door offset on the front of the Garage was delivered and erected for our Client in New Romney, Kent. Large single concrete Garages for both neighbours with 9′ wide up and over doors were delivered and erected for the neighbours in Ystrad Mynach. New Apex concrete sectional Garages were delivered and constructed for these Clients in Stamford and Telford. Our client in Groby required a concrete sectional Workshop. This would provide them with storage space as well as a useful workshop as they were converting their existing garage into additional living accommodation. Our client in Ruislip required a large prefabricated concrete shed for storage. Our customer in Chelmsford, Essex required a building to store his boat in. The dimensions were critical. As specialised in the Concrete Sectional Garage market we looked at various options and we were able to supply our client with the building to suit his needs. The extra height Apex Garage with a Brick finish to all wall panels, a Grey Metrotile roof and timber side hung doors was delivered and erected for him as soon as planning was granted. The existing garage was not long enough. The replacement pent roofed concrete sectional garage of 28′ in length suited the requirements of this customer. A concrete sectional garage with a stone finish with a wide up and over door and UPVC fascias was erected at the customer’s new home they had just moved in to. An extra height very large stone finish sectional building of 34′ in length was erected with an 8′ high up and over door to the front. A local irrigation company purchased many concrete sectional stone finish sheds to house their pumping units for various sites throughout the UK. A local property maintenance company purchased a single apex concrete sectional garage for a property owned by one of their clients. The proposed specification by the customers was achieved. A large double pent roofed concrete garage was erected without the up and over doors. The customer required this large building to be completely open. A large single concrete garage 12′ wide and 20′ long offering great value for money was installed for our client near Derby. During our initial conversations the customer thought that a new garage was going to be out of their price range. We were able to supply a single pent roof garage at a very reasonable cost which came within their budget. An awkward sized site was combined with the necessity for an extra height garage to house a large 4 x 4 vehicle. An ‘L’ shaped extra height Pent roofed concrete garage was erected. 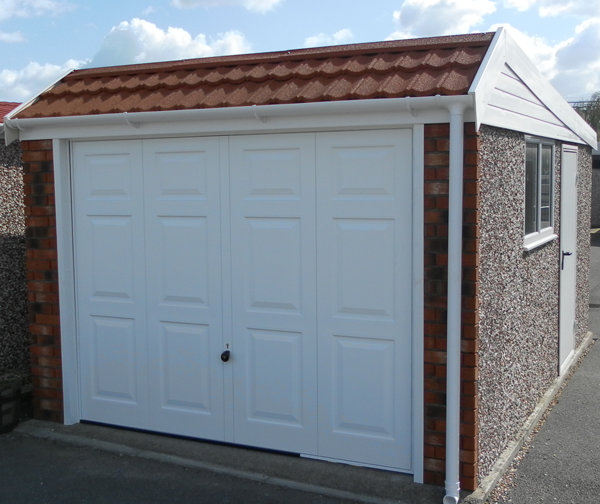 The garage had a brown fibre cement roof with ‘rosewood’ UPVC fascias and a brown personal door. A new replacement garage was required to give better access from the driveway. An apex concrete sectional garage of 12′ wide was erected with an 8′ wide up and over door that was offset to one side. A electric opener was fitted to the up and over door for convenience. A local builder working on behalf of his client ordered the Apex concrete garage. The old building was removed and the new garage was quickly erected onto the existing base. The new Garage was erected within a day. An apex concrete sectional workshop with UPVC fascias and three personal access doors was delivered and erected at the customer’s new property in Wiken, Coventry. Our customer required a large concrete sectional garage to be used as a Pottery Studio/Workshop. The kilns were too heavy to move from the existing building so they remained in place while the new studio/workshop was constructed around them. Translucent roof sheets were installed within the roof to allow extra light into the work space. A local Primary School required a large duel purpose secure sturdy storage building. A large double concrete sectional garage with two up and over doors was chosen and erected with a dividing wall to section the building in two. An apex roofed concrete sectional garage was installed with plain panels. A rendered finish to match the property was applied after construction. A double garage 18′ 6″ wide was constructed to the exact specification required by the customer. The old dilapidated garage was removed and the new Apex garage was installed onto the existing base. The Methodist Ministers’ Housing Society purchased a single Apex concrete sectional garage for their local Vicarage. A large single concrete garage with Georgian up and over door was erected in Boundary, Woodville. A high specification premium range garage 22′ long with brick front posts and UPVC windows, fascias and guttering was installed for Mr H.
A single Pent roofed sectional garage was installed for Mr H in Lancashire. Mr H required a large double garage but it needed to be 7′ 6″ high at the eaves. An apex concrete sectional garage 20′ by 20′ to his exact specification was installed. An apex concrete sectional garage 26′ long was installed for a client of a local builder. Mr J from Waterloo near Huddersfield was looking for a very competitively priced Garage. We were able to provide him with a robust concrete Sectional Garage with a Pent roof at a very reasonable price. Our customer required a new Garage to be built onto her existing base. A new Pent roof Concrete Garage with UPVC fascias was installed at her property in Gosfield, Essex. Mr C required a storage building to be installed in the back garden. A Pent roofed Concrete Shed 7′ by 11′ was installed with a steel personnel door. A Concrete Sectional Workshop 16′ x 10′ was installed in the back garden for our customer in Hall Green, Birmingham. The Workshop with a Pent style roof was complete with a wide window and personal door. A competitively priced concrete sectional garden building was built for our client in Essex at the bottom of his garden. Mr M contacted us as his old garage was in need of replacement. We were able to erect a new concrete sectional garage with a pent roof onto the existing base. Our Client was looking for a building that could be used as a Weight Room for her Partner as well as a Games Room for the children. An Apex roofed concrete sectional building with a 7′ eaves height in a stone finish was erected in their back garden for the family’s use. Mr C required a secure dry storage building to be erected in his back garden. We built a Concrete Sectional Shed 8′ by 12′ for a very cost effective price. Mrs M contacted us with a specific specification for a building she required to be used as an Art Studio. It was important to have light in the building so two wide windows were incorporated into the design. The Apex roofed Concrete Sectional Art Studio was built with steel side hung doors 8′ wide as well as a pedestrian door. Mr and Mrs B required a replacement garage. We delivered and erected a single Concrete Sectional Garage in a spar finish with a side access door and window. Our Client in Tregaron required a concrete Workshop to be positioned in the garden. After looking at various styles and options Mr B chose to have a brown powder coated personal door and Rosewood Woodgrain fascias and window on his Apex style Concrete Sectional Workshop. Mr R had a limited budget and was in need of a replacement Garage in a hurry. We were able to supply and erect the single Concrete Prefabricated Garage in a very short timescale at a very competitive price. Our clients from Turners Hill in West Sussex had a contract from the Ministry of Defence to supply a large single Concrete Prefab Garage and Shed for a property in Northwood, Hertfordshire. We submitted our quotations which proved very competitive and the Concrete Sectional buildings were delivered and erected. Mr D contacted us as he was looking for a flat roofed Concrete Garage to be built at the bottom of his garden but required a large 14′ wide up and over door because the access was limited from the service road. The Double Concrete Garage 18′ x 18′ was built to our client’s specification. Our Clients from Orpington in Kent required a new Garage for their property in Shirley, near Croydon. They chose a Concrete Garage from our budget range which offered excellent value for money. The new 8′ x 16′ flat roofed Garage with a maintenance free option was delivered and erected on to their existing base. Our Client, a Chartered Building Surveyor from Aberystwyth had a client who required a new Concrete Prefab Garage as their existing Garage and base was collapsing. We worked very closely with our client while he prepared a Scheme of Works to carry out structural repairs to the existing retaining and supporting walls before a new base was laid. The new Concrete Sectional Garage with a Stone finish complete with dividing wall to house two cars completely separately was erected onto the prepared site. After careful consideration Mrs H ordered a large 12′ x 12′ Concrete Shed with timber features which was delivered and constructed at her property in Scouthead. Mrs B contacted us as she required a Concrete Garage to be delivered and erected on to her existing base. She had a limited budget. We looked at various options and were able to offer a Concrete Sectional Garage to the specification she required within the budget she had to spend. We actually managed to supply the Garage with a few additional features but keeping within the budget. The Concrete Shed was delivered and erected in Crayford, Kent for our customer who required a strong unit at the bottom of his garden. Mr G wanted to paint the shed after construction so he chose an alternative finish that is more suitable for painting. Our Client in Purley, Surrey required a new Garage to house his two Classic cars. After various discussions and looking at the many options we have available the final design and specification was decided on. The new Concrete Garage in a Brick finish with a 15 degree pitched simulated tiled roof was erected incorporating four full height UPVC window panels to one side of the Garage as a feature wall overlooking the swimming pool. We were contacted by Norfolk Property Services and a local Civil Engineering Company to provide a Concrete Sectional Shed for Diss Junior School. After careful consideration and liasing with all parties an Apex concrete prefabricated Shed with a large pedestrian door was delivered and erected in the grounds of Diss Junior School. Our Client in Aldclune, Pitlockry had a specific specification in mind. We discussed and prepared a detailed written quotation for her chosen Garage. The new Double Concrete Garage in a Stone finish with a Grey simulated Tiled roof and one large Georgian style up and over door with electric opener was delivered and erected at her property in Pitlockry. Mrs V commented – “Looks lovely – I am very pleased”. Mr M contacted us with a specification for a new Concrete Garage. After various discussions the Apex concrete Prefabricated Garage from our range was chosen with a 15 degree pitched roof in anthracite, an eaves height of 7′ and a maintenance free finish. Our Client in Lincoln required a Concrete Sectional Garage in a Brick finish with a rustic look to blend in with the surrounding area. A large single Prefab concrete Garage 12′ x 21′ with timber fascias and window together with brown guttering was chosen from the vast range of Garages we have available in Spar (Pebbledash), Brick and Stone finishes as well as a new range of high quality Timber Garages. Our vast range of Concrete Sectional Sheds are available with a huge choice of additional extras allowing our customers to create the building to suit their needs. Our Client in Coalville required a prefab building some 20′ in length to be divided into two separate buildings. A dividing wall was built inside with two access doors. Our Client in Wigan wanted a maintenance free building for storing items, however, they wanted to have a plain panel finish. The prefab building in concrete plain panels was designed with a 4′ wide access door as well as a window. Our Client near Newbury had a very specific requirement. They wanted a prefabricated Concrete Garage with a Red Brick finish to all the walls. We supply a stylish range of Concrete Garages in a Brick finish in a choice of colours. The Garages are available with Pent roofs, Apex roofs and the Deluxe Apex with Metrotile roof. All Garages can be designed to individual requirements – placing windows and access doors where required. A vast range of accessories are available on all models. We were pleased to be able to supply Horsley and Send Cricket Club with their new Garage to be used for storage. They required a replacement building to be secure and strong but at a very reasonable price. Our Client in West Wimbledon had an old breeze block garage with a lean-to building attached. It was all in much need of refurbishment/replacement. After looking carefully at the vast range of buildings we have to offer, Mr P decided to replace all the old buildings completely with a new Concrete Garage 10′ wide by 30′ long with a Pent style roof. The old buildings were demolished and disposed of and the new Garage complete with electrically operated up and over door, UPVC windows, fascias and guttering and a personnel door was erected onto the existing base. A large Concrete Prefabricated Shed was required in Worksop near Nottingham to be built onto a base that has already been laid. The 14′ by 18′ precast Concrete Shed was erected with a window and pedestrian access door. Ideally suited to use as a Workshop or Hobby Room. Mr M from Leighton Buzzard required a Prefab Concrete Garage but wanted it to look like Brick. Within our range of Concrete Garages we have various designs of both a Brick and Stone finish. The Brick finish is available in a choice of Brick colours. The Red Brick Concrete Garage with a pent style roof and maintenance free features was delivered and erected. A 14′ wide Concrete Sectional Garage with a wide 9′ up and over door having an apex style roof was delivered and erected for our Client in Pontblyydyn. Our client, a local Building Company required a precast Concrete garage to be erected at the bottom of his yard to be utilized as additional office space and workroom. The Garage was required rather quickly and we were able to supply, deliver and erect within a short time scale. Shortly after construction our Client was asked to supply a similar Garage for one of his own clients. A second order was placed and their Client has recently had their Pent style Concrete Garage erected in Highgate, London. Mr C from Kilmarnock was looking to replace his existing garage which was leaking with a secure sturdy building to house the car in the winter months. With the harsh winters and an exposed site they were tired of scrapping the frost off the car, clearing away the snow and unfreezing the locks before they went to work in the morning. In an area prone to severe weather they wanted the garage to have an electric opener on the up and over door to eliminate getting in and out of the car to open the garage door. They looked at various styles we have to offer and chose a Double Garage with an Apex style roof with a Brick finish to the wall panels. We were contacted with an urgent request to supply an Apex Garage at a very competitive price with an exact specification to be delivered urgently. We pride ourselves on the service we offer our customers and were very pleased to be able to help this customer. Our Client – a builder in Sleaford, Lincolnshire requested details for his customer in Ruskington who required a quality robust Concrete Garage with a high specification. The builder laid the base to the required specification and the new Garage with Rosewood UPVC fascias together with a Brown up and over door was delivered and erected. All our Garages can be customized allowing each Garage to be individual and designed to the customer’s particular taste and needs. We supply a large range of prefabricated concrete sheds in many styles and sizes. Our Clients in Norfolk, Manchester and Bristol all chose the Pent roofed style in various sizes. Each Shed can be personalised for your own needs with a choice of access doors and windows which can placed in any side of the building. Timber or maintenance free UPVC features are available as well as our vast range of precast concrete sheds with Apex roofs. Our Client was looking for a very competitive price for a Concrete Garage 10′ by 20′ to be built on a new base he was having laid together with a new drive. The new Garage was erected with a side window and access door. We worked closely with our Client in Worcester Park and designed a Concrete Garage with a specific requirement. The new Garage was built in the back garden with a rear service road access to the property. The Concrete Garage 16′ by 16′ was designed with an up and over door as well as a personnel door to the front elevation both having extra security locking. The rear of the Garage accessed from the garden had a personnel door and two windows making an excellent Garage and Workshop. We offer a large selection of prefabricated Garages in a Brick effect. All Apex and Pent roof models are available in a selection of Brick colours with a variety of different roof finishes including a tile effect roof. High quality robust up and over doors and double glazed UPVC windows are standard features throughout the range. All Garages can be designed to the customers own requirements. Our customer in Crewe added an electrically operated up and over door to his Red Brick Garage and for our customer in London we designed the Red Brick Garage with an Anthracite Metrotile roof. Our Clients in Ipswich, Skelton and Bristol all wanted a Concrete Garage with an Apex roof, but we worked closely with our clients and designed all these Garages to the exact requirements they needed. Our Client in Ipswich required a very large Garage to house two large vehicles – a 20′ by 20′ garage with two large up and over doors. A large single maintenance free concrete Garage was the criteria for our Client in Bristol and our Client in Skelton chose one of our premium range Garages with many high quality features included as standard. Our Client in Bristol had purchased a property in Falmouth and required a precast concrete Garage to be constructed with part of the building as a lean-to against the house wall. The walls of the new Garage were erected in a plain panel finish so the walls could be rendered to match the house walls. We offer a large range of Sheds and Workshops in a Pebbledash finish as well as a Stone and Brick finish. Our customer in Bristol looked at all the finishes available and chose a design from our Stone finish prefab concrete Sheds which also included a large double glazed UPVC opening window and a powder coated steel access door. Valence Primary School in Dagenham wanted a maintenance free secure storage unit. From our vast range of Garages, Sheds and Workshops they chose one from our Brick effect range. The Apex style with the upgraded Grey Metrotile roof was delivered and erected with a wide access door. Our Client in Wickford, Essex wanted his new Garage to have a more rustic look and chose wooden side hung doors to the front elevation and a wide timber access door to the rear elevation. Our range of Concrete Prefab Garages are available with a large selection of optional extras so each building can be designed to your own needs and style required. Our range of Pent roofed concrete prefab Garages are available with many different features and come in all sizes from a small single Garage up to a very large Double Garage. Our Client in Bodmin wanted a secure sturdy building to set his model railway up in and chose to have a Concrete Garage 10′ by 18′. Our Client in Derby was purchasing the Garage for his customer and chose one of our premium pent roofed prefab Garages with many upgraded features as standard. Our Client in Swansea wanted a very large secure building for storage for his carpet business. He chose the pent style concrete Garage 20′ by 30′ with two large up and over doors to the front. The Village Hall in Kirkby Malzeard, Ripon required a secure storage unit. After they gained planning permission the new Concrete Garage with an Apex roof was delivered and erected with steel side hung doors. Mr S from Newmarket was looking for a large storage concrete shed to be placed behind his existing garage in the back garden. We discussed various styles and features and we provided a detailed quotation that was very competitively priced. The new concrete Shed 10′ by 26′ with an eaves height of 7′ was erected with a 4′ wide steel access door and window. We have provided a Building Company in Newcastle with a prefab concrete garage for one of their clients. They were very pleased with our service and contacted us again for one of their other clients. The Garage was required to replace one on a like for like basis. We provided the new garage with a 17.5 degree pitched roof with slate grey tile effect roof. This was complimented with a Georgian style up and over door with was electrically operated providing the customer with two remote controls as standard. We are very pleased to work closely with many building companies to provide expert help and guidance in the concrete garage market and also offering them high quality products at very reasonable prices.